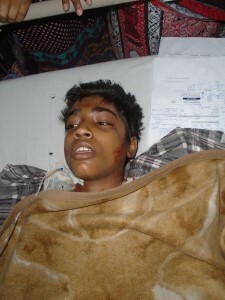 Christian Pakistani boy is burned to death by Islamists. LAHORE, PAKISTAN (BosNewsLife)– A Pakistani Christian boy who was set on fire by young Muslims after he professed his faith in Jesus Christ has died of his injuries, several sources told BosNewsLife Wednesday, April 15. Nauman Masih, 13, was attacked Friday, April 10, at a market in Lahore’s Gulshan Ravi area, where he reportedly got into a conversation about Christianity with two men on a motorbike, whose faces were covered. “They poured kerosene oil on him and set him on fire,” said Sardar Mushtaq Gill, director of of advocacy group Legal Evangelical Association Development (LEAD). The boy reportedly collapsed and fell to the ground before onlookers called emergency services and he was rushed to hospital. Police said in separate remarks that the attack happened when he came out of a shop where he used to work. Nauman sustained burns up to 55 percent of his body and died overnight in Lahore’s Mayo Hospital, said several Christians involved in the case. His funeral was held several hours later in Lahore, Wednesday, April 15, confirmed Christian charity Centre for Legal Aid, Assistance and Settlement (CLAAS). CLAAS said its team was in the hospital when doctors conducted the post-mortem examination. They allegedly wanted to kill Nauman to get his home. “Nauman’s father had passed away three months ago,” the officer explained. Both CLAAS and LEAD officials condemned the attack and stressed it was linked to the boy’s Christian faith. Nasir Saeed, director of CLAAS UK, told BosNewsLife that the attack was part of a wider crackdown on devoted Christians in the Islamic nation. “This latest tragic murder of an innocent teenager adds to the sense of fear that Christians feel in Pakistan, and comes soon after the community was shaken by two recent church bombings,” he said in a statement. Pakistan’s “government must pay attention and do all that it can to ensure the safety of its minorities and to assure Christians of protection,” Saeed added. The chief minister of Punjab province where the attack occurred, Muhammad Shahbaz Sharif, reportedly said he “has taken notice” of the murder. Christians have been torched before elsewhere as well: Last year in November angry Muslims burned to death a married Christian couple in an industrial kiln in Pakistan for allegedly setting fire to several verses of the Koran, BosNewsLife reported at the time. Shahbaz Maseeh, 26, and his pregnant wife Shama Bibi, 24, were attacked by colleagues at the brick factory where they worked in Punjab province. The couple had planned to flee with their three young children, according to Christians. That incident in Kot Radha Kishan town, some 64 kilometers (40 miles) southwest of Punjab’s Lahore city, happened after a factory manager claimed to have seen half torched Koranic pages between a heap of garbage, though Christian rights activists claimed they were targeted for their faith.